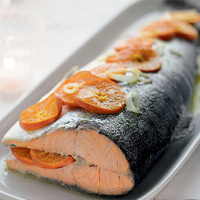 Clementines give the fish a subtle, fragrant flavour and make a seasonal, festive alternative to lemons, which typically accompany poached salmon. Preheat the oven to 220°C, gas mark 7. Rinse the salmon under cold running water. Take 2 sheets of kitchen foil (each piece large enough to cover the salmon) and use a little of the butter to grease 1 sheet. Set aside. Place the salmon on its side on the other sheet. Season its cavity. Place the clementines in a heatproof bowl and pour over enough boiling water to cover them. Leave to stand for 5 minutes, then drain and refresh under cold running water. Cut and discard the top and bottom from each clementine. Cut the remainder, with the skin on, into horizontal slices about the thickness of a pound coin. Fill the fish cavity with the parsley, a quarter of the fruit slices and the remaining butter. Cover the top of the fish with the remaining fruit slices, scatter over the shallot, then season and sprinkle with 4 tbsp of cold water. Place the top sheet of kitchen foil over the fish, butter-side down and pull the sheet edges together to seal tightly. Cook for 30-40 minutes or until the fish is just firm to touch and flakes easily. Remove the parcel and place on a heatproof surface. Leave to stand for 15 minutes before opening. Remove most of the fruit slices from the fish, and place in a sieve (leave the rest as a garnish). Lift the fish onto a serving platter. Using the back of a spoon, press the juice of the fruit slices over the salmon, and pour over any remaining cooking juices. This dish tastes great when served cold, too. Visit waitrose.com/howto for tips and video clips on cooking a whole salmon. Serve this with a zesty white such as a French Sauvignon Blanc. Or, if you're feeling extravagant, why not a crisp champagne?